Our newest update to GP is now available! A lot has changed. In our efforts to continuously improve the standard of the game; we’ve changing mugs, rebalanced reserved and made many other changes. A few key areas of GP are now more immersive with new collectables and prizes. Read on for the details of these changes! Mugs are targets you’re assigned from whom you may steal XP for your skills; Driver, Guard, Quartermaster, Loadout Specialist and Veteran. Up until a few month ago, you could literally steal the old XP that someone had earned. While this added fun, it was unpredictable and unfair. Additionally, it’s hard to defend on GP with three locations to keep on-top of. We decided to disable mugs while we explored ways to make it fairer. We’ve now added Medallions. When a player is given as a target, they receive a Medallion. This medallion gives XP steadily, for 24 hours. 10 minutes after being given (to give a little time for them to prepare their defence), this medallion may be stolen from the target. If stolen, the target may attempt to steal it back (and so on and so forth), in a kind of tug-of-war. 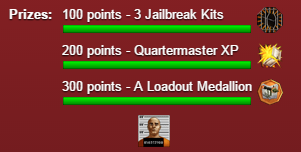 In events you’ll be awarded a prize once you reach certain levels of points. These prizes will be within reach of any moderately active player and give incentive to each gang member to strive a little further for their gang. Prizes include (depending on the event) XP, credit items, and random prize boxes with either medallions, dogs, or weapon kit parts. You’ll also receive a prize box for prestiging (reaching the end of the game). Dogs help you defend in turf wars. They add some additional protection and work alongside your gangsters. In some cases they may even be able to thwart an attempt against you completely, hiding your location details (dealer/gangster numbers)! Dogs need to rest after defending, but you can have a number of dogs protecting you. The longer a dog protects you the more loyal it will be, and the more protection it will offer. Kit parts may be collected for all weapons in GP. Once you have a complete kit for a weapon, it will greatly increase the effectiveness of every such weapon you have for a time. The reserved board (where players go if they choose not to prestige and start again) has been struggling for a time, with older well established gangs sitting unchallenged at the top, and no chance for newer gangs to realistically compete. Each reserved player may hold 100 properties maximum. Added a reputation war range (similar to ranked). Generic properties degrade a step rather than being completely destroyed in raids. Generic property upgrades from destroying property steps will only be given if you degrade a step you need (e.g. degrade a mansion to upgrade your Apartments to a mansion). Group conversations – You may re-invite people back into group conversations, if they did not choose to prevent further invitations when they left. Spy locations – These are no longer so random that you may be given the same location repeatedly or fail to be given the location you may be hoping for. Captchas – If you do a lot of actions within a short space of time you currently find you have to type out a code to prove you’re not cheating every so often. You’ll no longer have to enter a code in the future, and will instead simply have to choose the correct item from a small number of items (much less of a headache!). Bug fixes (including the leaderboard page issue). Exploring ways to discourage “set-ups” during events. Making it easier to protect your drug labs from mobs of players (known as “trains”). Improving the existing casinos, adding new casinos and a novel gambling event. Extra information in gang applications. A big thanks to those who are a part of GP. Most of this update came to be from our player’s feedback, and we hope each feature and change enriches our ever-growing game and dedicated community.